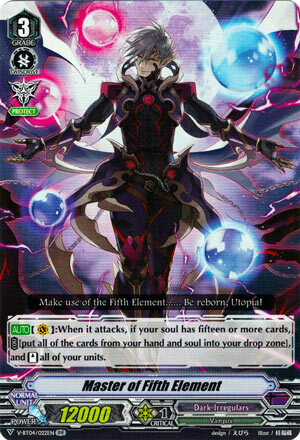 [AUTO](VC):When it attacks, if your soul has fifteen or more cards , COST [put all of the cards from your hand and soul into your drop zone], and [Stand] all of your units. For the dank plays with Death Anchor. Rather ironic he discards your entire hand so Protect is like the worst gift to give to this dude. Aside from that a re-stander is almost always universally good. He’s ludicrously expensive to pull off but if you can proc Death Anchor you can certainly proc this. He’s a big ‘death-or-glory’ play as once he procs once you have only two cards in your hand for guarding and are almost certainly fucked next turn, but he’ll make a better finisher in some cases than perhaps Demon Eater, Death Anchor’s other partner.